He shuffled in the bed. A calculated shuffle; just wiggly enough and just noisy enough to wake his sleeping partner. “No,” came the muffled reply, deep beneath the winter-thick duvet. “The tap is doing it again,” he said quietly. “The dripping thing. The tap. The…” he paused, grasping in the night for the foreign word native to this land. It was dark. There was no way he could see it, but boy could he feel “the look”. Friday Fictioneers is hosted by the freshly published Rochelle. Join in the 100 word flash fiction fun or simply go read the other entries here. A dripping faucet can be so annoying, how ever…we all know ‘the look,’ don’t we? Well done. That “feeling” is just guilt! Haha this was so funny. My husband and I have these types of discussions in the middle of the night – and we speak the same language! PS I agree… I’ve never been able to take to the word faucet either. LOL. There is nothing more annoying as the ‘drip drip drip’ at night . Fun read. I know the situation, too, and am giver, and receiver, of ‘that look’. What a fun story. I love the way you mentioned the different words “tap” and “faucet.” My Dad’s parents were from New England, and my mom’s family were all Kansas natives. 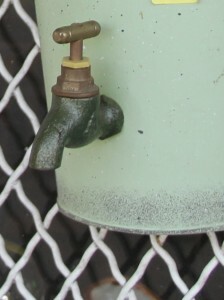 I grew up calling it a “tap” but knowing full-well what a “faucet” was. And the story’s a good one too. Nice work. Nicely done. My FAVORITE part is the calculated shuffle in bed just wiggly enough to wake his partner. That is SO REAL. That’s fun. I bet they discuss this over a tense breakfast in the morning. And rightly so! If I can sleep through the dripping I don’t want to be awakened by someone who can’t. Tighten your own faucet, I say! “The look”, I like that. 🙂 I’m curious, what country do they use “faucet” in, versus “tap”? England? Growing up in Canada, we used them interchangeably, so both seem normal to me. Even in the dark, I know that’s a humorous, true-to-life story. I should have written mine before reading others’. Now I can’t post the ‘drip…drip…drip’ one I was thinking of. The midnight conversation and the ‘look’ – brilliant, made me smile. A well written look but a dripping tap can be so annoying to he who hears it. I believe a wriggler that calculating deserves Sandra Cook’s screwdriver 😉 Enjoyed the tale. Funny and everyone knows “the look”. One “look” speaks a thousand words – even in the dark. I must agree…those looks are felt even in darkness. Good story! Oh, yes. I’ve been there. This sort of thing ought to be written in to pre-nuptial agreements. Do we take turns? Does the one who didn’t turn it off do it? Middle of the night is no time to be sorting it out. Fun story. In Texas, we had faucets, but sometimes they were taps. Outside, they were hydrants.